The name mighty Mite totally fits this vacuum. It has strong suction & the additional attachments makes cleaning a breeze. I would recommend this vacuum. Eats pet hair for breakfast, lunch, and dinner! Incredible suction! Finally! This awesome little vacuum has given me the edge in the war against pet hair! I'm the owner of 3 cats and a dog, and this vacuum has cut my floor cleaning time in half. Great on my rugs, hardwood floors, tile, and laminate! I'm so glad I no longer have to drag out the broom and dust pan! I can just keep vacuuming from one surface to the next, and I can reach my whole house from one centrally-located outlet! It has also worked great for a quick clean-up of white dog hair on my dark brown bonded leather sofas. This is the first canister vac I've owned, but it's so much easier to maneuver than my old bulky up-right vac...I now have no plans to ever own another up-right! I am happy enough with it overall to give it 5 stars, although I do have a few critiques: As others have mentioned, the cord keeper on the bottom is not terribly convenient, but not awful either - I can definitely deal with it. I'm glad it came with 2 bags because I looked for the required size before it arrived, and couldn't find them locally...Will have to order them online, which is a bit of an inconvenience. I wish the floor sweeper attachment was just a bit wider/bigger to cover more area, but the additional attachments included are great for cleaning fan blades, blinds, etc. And lastly, I notice that the plastic of the hose and the attachments is charged in such a way that pet hair sticks to it like a magnet...I end up having to vacuum a large amount of dog hair off the floor attachment when I'm done vacuuming my rugs, but that's not really a bad thing since it means I'm getting up even MORE pet hair! I can't imagine that anyone would be disappointed with this great little vacuum! I needed a small vac just for my kitchen and purchased the Eureka Mighty Mike Canister Vac. WOW - was I surprised at the suction power of this little guy. It is so lightweight that I've found many other uses for it, especially stairs. Also, the wand seems extra long so I don't have to bend over at all when vacuuming, a plus for my bad back. I had purchased several small upright vacs (electric & cordless) and was disappointed with the performance of each, so I was a bit skeptical about this vac, but it turned out to be a great purchase. This little Eureka canister vacuum is a mighty power house! Very easy to use and very light to handle. I use it almost everyday. Picks up everything from carpet to floor. An excellent little vacuum cleaner! I should start off by saying, I never write reviews. But it was because of ALL the reviews I read on about what felt like 100+ vacuums, that I am writing this. I am your basic consumer, I only by vacuums based upon price and convience( i.e. at walmart or target) so to buy something online was quite the challenge. Staying price consious I search high and low at multiple websites and various style, and brands of vacuums. I have a LARGE black lab, that sheds like crazy!! I was desperate, I needed something that would rid me of all this hair, and stay within my under $80 price range. Happy day, I finally settleed on the Eureka, and eureka indeed! Worked like a dream, as good as all the other reviews say so. Nice suction power, easy to handle, easy to put together, just easy easy easy! I'm so happy with this purchase, i had to share it with all! First of all, the name of the vacuum is Mighty Mite, not Mighty Mike! A "mite" is a small object. That is the whole point. It is a small vacuum, but it is "mighty" powerful. Let's get the name of the product correct! Yes, it definitely lives up to its correct name. Easy to carry around with lots of vacuum power. We use it to vacuum all the places that you can't get with a normal floor vacuum. In the past I purchased small vacuums but ended up returning them because of poor quality. The Eureka Mighty Mite is a sturdy and a powerful vacuum. Even the plastic used is very sturdy. I bought this to replace the Mighty Mite I had been using for about 15 years. I like the canister style for bare floors and under furniture. It is a workhorse. I recently purchased a 12 amp Mighty Mite vacuum cleaner. This is about the 4th one I have had in the last 40 years. This one is more powerful than my old ones. It works great on tile, wood and short nap carpet. I have a Sears canister but this works as well and is a lot easier to use. I use is to vacuum out my car if I need too. Its geat for reaching cobwebs in the ceiling cornrers. I leaves no marks on the wall. I love it! I really hate vacuum cleaners. They never perform like they are advertised but they are a necessity in life. I had a hand cannister vacuum that died so searched for a new one on Overstock. I am impressed with the suction this little vacuum has and it really works well on my wood and tile floors. I have carpeted stairs and needed something light to carry. This vacuum fits all the features I need and I think it was an excellent price. Also, love the Overstock low shipping rates. I did not want to spend much on a vacuum since I would only use it for light duty. Pleasantly surprised as to its power and ability to pick up dust and dirt. Would recomment this to anyone on a budget. This is an amazing little vacuum. It has great suction, and it gets into small places too. I don't think it's any louder than any other vacuums I have had. The only problem is where to store it, the long hose is hard to put away, and the cord wrap on the bottom is not very convenient. But it is worth the price, really works great. I am really happy with this vacuum, it is very powerful, lightweight and seems to be well built. I got it for my wood shop which has a compressed foam floor tile floor. This vacuum cleans up every speck of sawdust and debris on the floor. I have RA and my mobility is very limited, but I had to trouble pulling this around, the wand is very light and easy to use as well. There is an adjustable switch on the handle to control how powerful you want the suction to be which works very well. I have tried a bagless model beforehand and find the bagged models to be overall more powerful. Very happy with this purchase. I have two dogs, two kids, and all hardwood floors in my home. This was not the right vacuum for me. The wand had wheels on it and it would only go in one direction. This would be fine for a small space or for use like a dust buster. 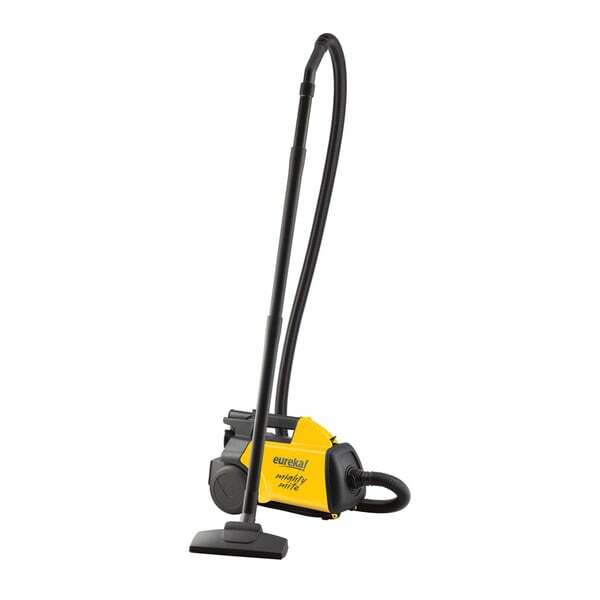 Terrific small Vacuum with strong vacuum power. It stays in between my Washer and Dryer and is ready to clean my Dryer screen (Which is nice). I've had mine for years and it's just as powerful as the first day I used it. Works pretty well for a little vacuum. Good product. One of my sons has concrete stained floors and needed a new vac. This works well and doesn’t take up much room. Would recommend to others. Great suction!! Better than any other vacuum I've ever owned. This is used all the time! I love this little vacuum, and use it for the "messy" jobs of basement and car clean up with success! Great machine. I purchased 2. One was a back up. "is this vacuum cleaner good for carpet AND hardwood floors?" "I have had a Eureka Mighty Mite for many, many years and finally it needs to be replaced (the motor, so strong for its size, is no longer as strong). I want a new Mighty Mite just like my original one used to be but have heard that the newer ones have wands and tube that are not as strong and long lasting, being made of somewhat inferior material. Does anyone know if the new tube, intended to carry dirt and dust to the bag in the canister, and the wands, made to extend your reach when using the the attachable tools, are of the same diameter as the older, sturdier ones are? If so I might be able to exchange the ones that came with my first machine for those that come with the new model and have the best of the older and newer worlds joined. I realize this would be an extraordinary piece of luck but I think it is worth asking about. My thanks for any information on this subject that you can give me. Not knowing the protocol for submitting this question I enclose my email address. " I have no idea about the size of the old attachments and whether they will fit on the new vac. My experience with the new vac is that it is powerful and does the job. I don't like that the entire vacuum is plastic. My old Eureka canister vac was metal. The hose is somewhat stiff and not very flexible. "The vacuum cleaner is great. However, it does not have an on or off switch. Is this normal? It is in perfect condition except for that.Thanks so much." "where can one purchase bags? does the vacuum come with bags when ordered?" "Specifically, what are the items that make up the on-board tools. The description listed only states on-board tools included with the Eureka 3670G Mighty Mite Canister Vacuum." It comes with a separate "brush" type tool and an crevice tool. "were can i buy bags. isthe cord retractable?" I just noticed an ad for the bags on this site. When I was reviewing other reviews, when purchasing, they said to order from manufacturer. So I guess I'm not sure. As to whether or not the cord is retractable, NO the cord does not retract. Other than that, I am so happy with my vacuum. I hope this helps. I'm sorry we do not currently sell the bags. The part number is Eureka Part#60295C. This does not have a retractable cord. I use the micro liner bag style mm. They do not specify for Eureka mighty mite vacuum. I think they are an off brand but they fit perfectly. "How long is the hose?" Hello wmae, this item features a hose approximately 7 feet long. Thank you for shopping with us.